Question: How to make Badane Ennegai? Person #3: Hey, hey… Aren’t you forgetting something? The authentic recipe calls for roasting the spices and coconut. Person #4: Yes, roast dry chilli preferably Byadagi Menasu. Person #5: Oh not Byadagi, you have to use Kolhapuri Menasu. It should taste spicy not bland!!! That’s how we Hubli-Dharwad people like! Person #6: Cut the stem of the Brinjal and make ‘+’ mark half the way. Person #7: Hello… You always keep the stem. You don’t take the crown away from this ‘King of Vegetables’. Person #8: Ennegai is a dry dish. Person #9: I don’t agree with you. 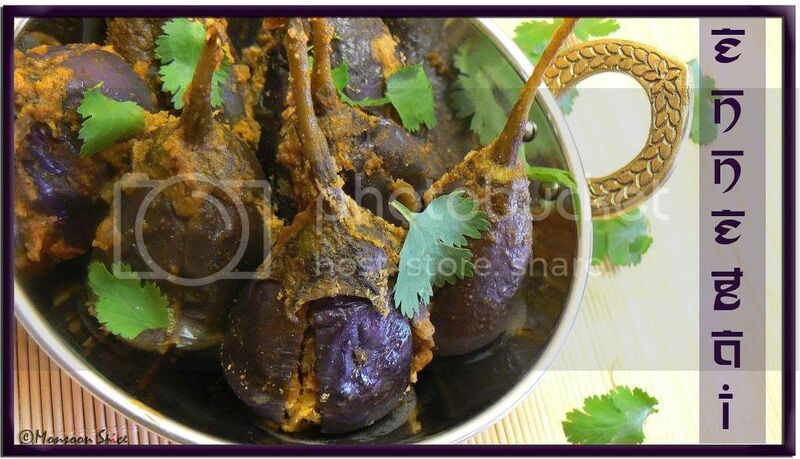 Spicy, aromatic stuffed Brinjals are cooked in creamy gravy. Person #N: …… This is the authentic recipe for Badane Ennegai. Yes, ask some ‘N’ number of Kannadigas as how to cook Badane Ennegai and you will surely end up with ‘N’ methods of making them. Each and every household has their own ‘authentic’ recipe for cooking this delicious Baby Brinjals. Some stuff them with freshly grated coconut and some with desiccated one. Some roast the spices before pounding them and some grind them with out roasting first. Some make them mild where as some prefer spicy. So it’s not a big surprise if you find different versions of Badane Ennegai at different source. Well, for that matter I have already blogged two different recipes for Badane Ennegai in my blog. So to make it perfect 3, here is another way to cook Badane Ennegai. This recipe is from my Aunt S who is not just a wonderful cook but also has published a wonderful cooking book. I usually refer to this cook book of hers, gifted to me by her on my wedding, when I am unable to clarify some doubts with my Amma or Atte at odd hours. Well, even after two years of cooking on my own there are quite many times I keep calling them if I am not sure of some ingredients. And yes, I still haven’t learnt to write these recipes in my diary. Thanks to this blog, as it is just two or three times a week my Amma or Atte are forced to talk to me at odd hours. Well, it’s a vast improvement from getting some half a dozens of calls every single day ;) May be they’ll not have to worry about getting woken up at 2 in the morning in few years of time!!! This delicious recipe of Badane Ennegai is a keeper for sure. My aunt stuffs the Baby Brinjals is lightly roasted dry/desiccated coconut with aromatic spices and peanuts for nutty flavour. Addition of onions in stuffing adds little crunch and sweet taste and the tamarind paste gives that oomph factor. Serve it with Dal Rice or Rasam Rice or with Roties. But the best way to eat it is with Jolada Rotti in Dharwad style. 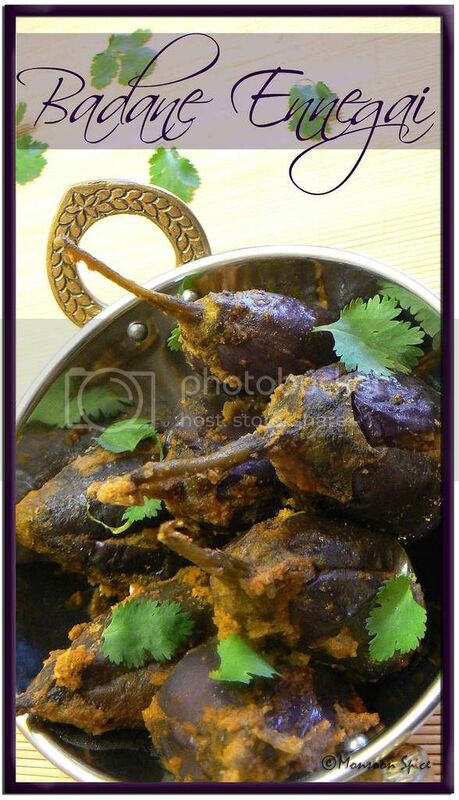 This favourite dish of mine goes to my dear friend Pooja for her VOW-Brinjal. Dry roast desiccated coconut, channa dal, urad dal, coriander seeds, cumin seeds, hing and dry red chillies in low flame for 2-3 minutes till you get nice aroma. They should be roasted nicely and turn light brown. Grind these roasted spices with turmeric powder, tamarind paste/water and salt to taste to smooth paste adding very little water at time. Mix this ground mixture with finely chopped onion and coriander leaves and keep it aside. Clean and wash the baby brinjals and slit them from bottom making a ‘+’ mark till 3/4th. Keep the stem intact. Keep them in a bowl of cold water to stop from discolouring till required. Take about 1 tbsp of this ground paste and stuff these baby brinjals and keep them aside. Now heat oil in a pan and add cumin seeds and curry leaves. When cumin starts to sizzle, arrange the stuffed baby brinjals in a pan. Make sure that the pan is big enough to hold all the brinjals in a single layer. Sprinkle about a tbsp of water and cover the pan with lid. Cover and cook these brinjals undisturbed for around 10 minutes on a medium to low flame. Open the lid and slowly turn the brinjals. Add left over ground paste if any and sprinkle another tbsp of water if required. Cover and cook for another 15-20 minutes. Check in between to make sure the ground paste doesn’t stick to the bottom of the pan. Sprinkle little water in between if required. Serve this Badane Ennegai garnished with chopped coriander leaves with rice or roties or with Jolada Rotti as it is traditionally served. Choose baby brinjals that are firm to the touch, have a smooth and shiny skin. The stem attached to them should be lively green in colour. The tender purple brinjals are the tastier ones. The ones with black seeds are mature ones and will taste bitter. So make sure that you choose the tender ones and have few extra ones just in case. Store brinjals in a cool dry place, but avoid placing them near tomatoes and apples as they give off a gas that enhances the ripening process. Use the brinjals within 2 days. Refrigerating them doesn’t necessarily keep them fresh but if necessary, the brinjals may be kept in a plastic bag in the refrigerator for as long as 5 days. An Ode to Potato ends on 15th of March (GMT Time). Send in your entry before the deadline and join us in the singing. Bake, boil, mash, fry, sauté, grill, stuff, cook... The choice is endless. Please go through the guidelines and include all the required information in your post and mail when sending me your entry. Don't forget to add Your Name, Your Blog Name, Name of the Dish you cooked, Perm Link of the entry along with the gorgeous Photo of Potato dish. Click Here to find out more information on this event. Great dish girl, I love the stems sticking out of that plate. I am making Marathi style Bharwa Baingan today and akki rotti tomorrow. I keep the dish for a day to make it taste yummy. Love the dish. Good one. I will try this way next time I buy this kind of Badnekai and will post. Busy day for me today, got a last LASIK post op check up appointment, got to cook and do all blogging before noon! I love to make these stuffed brinjals Sups, yours look so delicious that I cannot wait to cook them as its been quite a while since I made this dish!! Wrong time to look that amazing dish, Its 2:00 now, Soup n Bread toast for Lunch @desk. Poor me!! I forgot to mention, I love your new profile picture!!! Its breathtaking as I love drenching the rain, fond memories of playing in the rain in India Sups. Simply incredible shot!!! Sia,I love baby brinjals...and that's a gorgeous picture. When I saw the post , that lovely handle of your Kadai made me think that this might be your entry to Click-Metal :D.
As I read your post I get to know that this Lovely pic is for Me :D.
So true the name is "king of Vegetable " , really you added a meaning to this humble veggie. Resembling with your logo for ODe to potato is Brinjal :)). You made "Wow" recipe for Vow :). Many thanks to you and your aunt for this lovely traditional recipe. P.S- try sending that Ganesha spoon for click - that would be lovely. Just a suggestion though . As you said, my mom does it differently. The recipe is perfect and the dish is picture perfect. It looks so delicious. I have heard about this dish and seen pictures in cooking books, but never ever made them. wow..that looks yummy...now that you have made three..you can make another one...check out mine..my mom's signature one!..you will surely love it..
Sure Sia that would be the result if you ask for any recipe :) Each cook has their own likes (quirks!). But for the Badane Ennegai looks totally delicious. Anytime of the day I am ready. Hi..your food looks yummmy. seems you make very tasty food.Thanxxx for the sharing them. that first pic is a beauty, Sia! btw, do u really call them at 2am?? OMG the pics are really really tempting. can I drool over here for sometime? 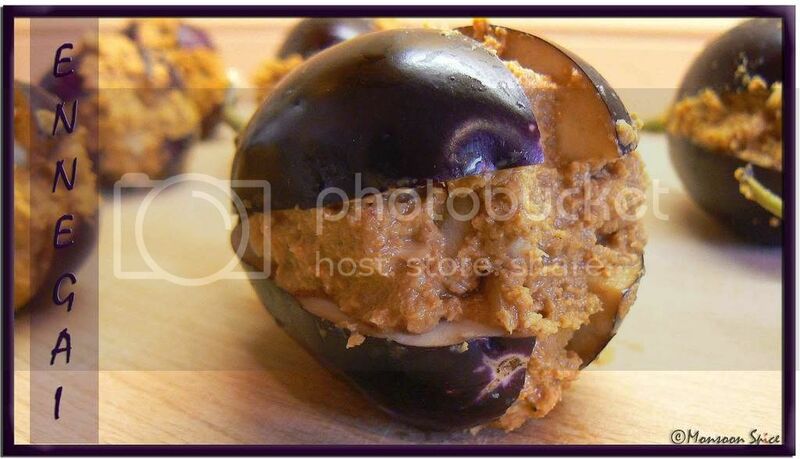 I am not a great fan of brinjal but the pics and the recipe makes me to try it. Bookmarked it. These babies looks cute and tasty. In Belgaum, we have tasted diff versions. But as a kid I did not care as long as it was tasty. Now yours looks like a must try..bookmarked! sia..spicy brinjals there..i just wanna try..my nana amma does it in a similar way too. Btw Sups, I couldn't read the entire sentences on your post, they get cut off on the right - maybe you should change the font size. hey sia this is my all time favourite.. i love this veggie in any form.. lovely pics..
hi Sia!! this wonderful looking dish is so new to me....i have had something like this made with peanuts by a maharashtrian frnd of mine. Hey Sia!! Am not a fan of brinjals, but I like the stufing! Crazy huh??!! I'll take that and polish it off with roti!! hehehe! Wow... I totally agree on the N concept. The pics are brilliant,kadhai very cuttttttttee! And i love 'em all :-D. That conversation is so true about so many dishes, the true beauty of Indian cuisine! Lovely ennegai recipe, Sups and the pictures are YUMMMMMMMMMMY! Wow.. Badnekai ennegayi.. I love it with Akki Rotti !! Lovely ennegayi Sia !! My Amma(MIL) makes the same way !! Never tried here in US.. Now i vil :) !! Looks yum, Sup! Love your pictures, as always! Another wonderful recipe as usual. Love the pics. Nice presentation. This looks beautiful Sia.. i made the stuffed version in gravy but the dry version looks very enticing. So true about all this variations, a new recipe every 5 kilometres. wow, I am drooling over the pictures supriya! This sounds so delicious! I love stuffed eggplants and each time I find the tiny ones at my local Indian grocery store I make a beeline for them. Your pictures are fabulous. Great fan of your blog for quite some time now. Thanks for sharing the wonderful recipes. Your presentation is awesome. They looked good enough to eat before you even cooked them, Sia! Brinjal in any way shape or form is for me :) The stuffing is heavenly! sia, looks yum bayali neeru battidu :) i am really drooling at those photos. Looks yummy! I totally agree, there must be thousands of variations of badane ennegai and best of all they all taste wonderful. Loved your version as well. LOvely recipe and great blog!! Hi Sia, Recently I tried ennegayi and it turned out really good. Shortly I will post the Kannada version of the same in my blog. ..thanks to ur recipe..
Namaste! I am Sia and welcome to Monsoon Spice, my virtual home. Thank you for all your comments, inputs and feedback. I really appreciate the valuable time you spent browsing through my recipe repertoire. I hope you have found what you are looking for today. Feel free to leave any questions or queries you have on the recipes posted here. If you have any recipe requests, please drop a line at Ask Sia page. I will try to respond to all your queries as soon as possible to best of my knowledge. I welcome all your valuable inputs and constructive criticism as long as it is meant to help and improve the blog. I reserve the right to delete any comments that are rude, abusive, written with the intent to advertise, contain profanity or considered spam. I hope that you will stop by again to read my rants, learn new recipes and share your ideas. Have a good look around and enjoy your time here. Thank you once again! Never want to miss a post? Get all the latest posts right into your inbox! 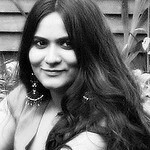 Born in India and raised in fun and food loving family, I currently reside in UK with my better half and my two babies, five years old son and nine years old food blog. My cooking style has strong root in Indian culture and at the same time embraces the world cuisine with equal passion. With never ending love for food, spice and life, I am passionate about cooking and making Indian food less intimidating, healthy and easy to cook which reflects in my blog Monsoon Spice which has been ranked one among Top Indian food blogs. Think twice before you steal, instead ASK FIRST or send me an email! Monsoon Spice by Sia Krishna is licensed under a Creative Commons Attribution-NonCommercial-NoDerivs 3.0 Unported License. Looking for your favourite recipe @ Monsoon Spice? Just enter the key word below and find what you want. All the pictures and contents on Monsoon Spice are protected by Copyright Law and should not be reproduced, published or displayed without the prior written permission from me. Information on Monsoon Spice is not to be used in any form of publishing on other websites, commercial purposes or other media without explicit permission from me. Thank you for visiting Monsoon Spice. UK: England & Wales License.